I can remember when my mother gave up and decided to just let me choose my own clothes. I was probably seven or eight, which by today’s standard is a bit old for this rite of passage, but in the 1960s my peers could not believe Mama let me do the picking. But she wisely knew that sooner or later I’d insist on it, and besides, she had another daughter to dress up in pink. The truth is, all people in my culture (and probably yours as well) choose their clothes if they are over the age of five or so. Even people who claim to care nothing at all about what they wear, do, in fact, care. My father-in-law was a great example. He was a notoriously sloppy dresser, and he repeatedly reminded us that clothes don’t make the man. The problem was that he had a long list of things he would not wear, and a very short one of what he chose to wear. He had no jeans, but several pair of identical khakis. He had the same plaid button front shirt in twenty different plaids and colors. He never wore a pair of sneakers. He loved cardigan sweaters, but pullovers were verboten. One year for Christmas we found what we thought was the perfect gift for him – a red cardigan with a big S applique that came from his alma mater, NC State. He seemed to like it, but we noticed that he never wore it. Some time later the cardigan reappeared, without the big S. He had carefully picked it off. It then occurred to me that he thought wearing the sweater would look like bragging in a community where college graduates in his age group were rare. He knew that wearing a sweater that he thought advertised his education would make him look as though he was putting on airs. John may have claimed that clothes do not matter, but he clearly did know that what we wear sends all kinds of messages to others. Clothes don’t have to have letters, or even words, on them in order to send messages. It’s easy to sit on any park bench and watch people passing by, and make judgments about those people based on their clothes. Sometimes you will be right, and other times you will be wrong, but the message is sent never-the-less. For centuries clothing has been a sign of social and economic status, a reflection of the position one holds, and even where one resides. When I travel to New York, I plan my clothing carefully, so as not to look so Southern (and out of place). In high school, the girls who had professional dads like doctors and lawyers carried Aigner handbags, while those of us whose fathers worked at the paper plant carried cheap imitations. We just can’t get away from the fact that in our culture, clothes have meaning. They send messages. And the most obvious messages are those that are in print. My old Merle Haggard shirt you see above dates from 1983 when Outlaw Country was an interesting alternative to Punk and New Wave. By then I was teaching and pushing thirty, and it seemed that Rock was dead anyway, so we started listening to Haggard and Cash and Nelson. 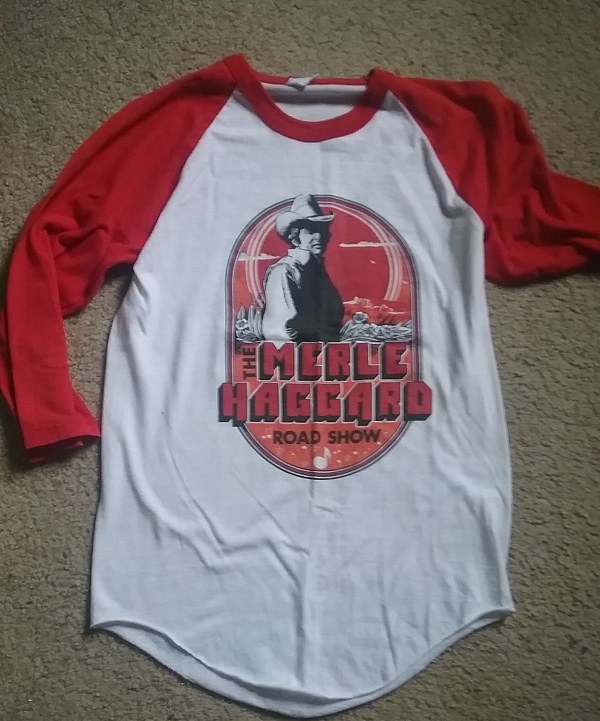 I got the shirt at a concert in Asheville when Haggard was arrested for drinking onstage. Over the years I’ve worn it when feeling particularly badass, and it never fails to send that message, at least it sends it to the many young folks who comment on it. It never fails to make me feel cool, though the truth is that I was merely lucky enough to have the money to attend a concert and buy the shirt way back in 1983. But does that even matter? The message is sent, though I suspect that to some people the message is, “Why is that old lady wearing a Merle Haggard shirt?” It may not register with some that I was once a cool concert goer. Today clothing with writing and logos is so common that one need not pay attention to all the other sartorial clues. At a glance you can tell what team that guy is rooting for, where his wife went on vacation, daughter’s favorite Disney princess, and the attitude of the teenage son. One thing I feel very confident in saying is that these messages are true. A Red Sox fan does not wear a Yankees hat. So when a public figure is seen wearing a jacket that says, “I really don’t care, do U?” you can be assured that the message was intended. Whatever she doesn’t care about, the message was sent, and the viewer uses his or her own experiences and perceptions of the wearer to decipher the message. And who in their right mind wears a jacket in this heat? You would never hear me say that, but of course you already knew it! Sadly the jacket Moronia to wear is a statement/theme message jacket reserved usually for a young teen/a valley girl / flippy I need to be noticed /am cool statement. Very sadly exactly the type a young teen would covet. She is not very bright/has no recorded education/not sophisticated what so ever. The very sort of thing those young girls in “captivity”(if they had a jacket) would identify with. the message is clear!!! The message is clear-even IF it was intended for (what her so called spokesperson )sys. Totally thoughtless / inappropriate and glaringly reflective of who /what they/she is. MESSAGE DELIVERED. Yes, it is puzzling why a middle-aged woman would wear a garment clearly intended for a teen pouting at her/his parents! Good essay and great punch line. I remain utterly baffled (and annoyed) by Melania Trump’s jacket and the distraction it has created. I have heard literally dozens of creative explanations from other women. My favorite today was that her trip to the hospital wasn’t about a kidney problem: she was being medically punished for transgressions, and made to toe the line or else from here on out. The jacket was forced on her (for unclear reasons) since Melania would never wear a $39 out of jacket from Zara – two years ago. Ok then. Okay, I’m not a fan of conspiracy theories, but my favorite has to be that the White House was intentionally stirring the cesspool. They knew what the reaction would be, and actually hoped the media or some Hollywood “Elite” would pull out the usual derogatory terms so they could react to horror at such nastiness. Somehow this doesn’t seem to be so far-fetched! All that I am personally left with is that Melania or her handlers are trying to send a message…but I think she or her handlers are too dumb to understand all the variations of the message. I feel sorry for her. (And…she’s almost 50 years old; if she’s chosing her own clothing, why doesn’t she wear clothing more becoming her age?) I look forward to reading her ghost written memoire in 10 years; goodness knows she won’t be able to write it herself. She has a stylist who picks her clothes for important events, and he claimed to have never before seen the jacket. A reasonable person would think Melanie Trump chose that jacket, the question is what message she is trying to send. Like any other human on earth, there are probably hundreds of things she doesn’t care about. There’s really no way to know her intent, but the fact that she wore that jacket to Texas ties the jacket to her visit. I bought a Cincinnati Reds tee shirt to wear to a game there last summer. Three days later I went to a Chicago White Sox game. I did not wear my new Reds shirt as it had no relevance to the second game. By wearing the jacket to Texas, she declared its relevance to the event. Exactly, to say otherwise is to deny that the emperor has no clothes. Her message was for the media and the haters. Clearly there are haters here too. After what has been said publicly about her son this past week, can those in their right minds not get her point?! DUH. Long live free speech. I don’t think there is any way to know that this was meant for the media, so maybe I’m not in my right mind! Yes, I know her husband tweeted such, but, seriously, how would he know? As for her son, the attack on him was despicable (and not conducted by the press, but by a has-been actor}, but I think it is nearly impossible for her not to care about that. What if someone said that about YOUR kid? Most people would be out for blood. And yes, long live free speech. That’s why all opinions are welcome here as long as no one stoops to name calling or insults. I agree; aesthetically there was no reason to chose that jacket. Wow Lizzie – that was excellent! I am skeptical of every story I hear today as well. We have to be, these days. So I did do some checking. If you Google “Me ne frego fascism” you’ll see a slew of information by multiple mainstream sources on the phrase, what it meant in Mussolini’s day, and how it’s being used and spread by neofascist movements today. If you have time for it, I recommend The Guardian’s long article, “The Fascist Movement That Has Brought Mussolini Back to the Mainstream”. I won’t post the link here because I don’t want to hijack Lizzie’s post. But I found it very informative. That is one scary article. I’m not inclined to believe any such facebook post until looking into it deeper. Thanks for the notice about this issue! What if Melania’s Jacket statement is actually a way to keep an outrageous situation even more firmly associated with her husband and the WH? What if it was a brilliant passive aggressive move? Remember when Melanie wore a pussybow blouse when her husband’s insult to female anatomy was leaked? Her refusal to join him in the WH for months after his election… her quick frown at the inauguration as soon as his back was turned… Makes one wonder. I can actually believe this! She might not be as “dumb” as everyone wants her to be. Yes, there was indeed method in that madness. of slaves that we make of Mexican immigrants. Yes. That could be the most thoughtless angle of all. Great post! Clothes are important! Such a well written post. I love the approach you took with this. Yes, but it is a bit on the snug side!